Did you think we forgot about you? You may have guessed what happened: I got a job! I am now teaching kindergarten full time at a school just a few blocks from our house. I interviewed weeks ago, then heard nothing for almost two weeks. Four days before school started, I got a call with an offer, and I jumped at it! I spent the weekend getting my classroom materials out of storage, setting up the classroom, getting some work-appropriate clothes (I was 8 months pregnant last time I got work clothes!) and getting my head ready for a class of 27 kids. To top it off, I spoke at a local Relay for Life event, sharing Scarlett's story in front of hundreds of people. Thursday was my first day of professional development before school began. It was also Scarlett's first day of preschool! Technically, she is in the "toddler class" at her school, 3 hours each day Monday through Thursday. She loves it, is engaged throughout the class and is starting to show some great progress already. She has an aide who helps her get around the room, and with help from the teacher, speech and occupational therapists, she is doing amazing things! Today, I hear she did some yoga with her pre-K (4 year old) buddy. These new developments have led to some major changes in our house. Since I am working all day, Chris is now the chauffeur for Scarlett. He works at Starbucks on the weekends (for now...) and manages Scarlett's schedule all week. It's hard for me to miss out on everything, but I am so happy to see him get the chance to spend more time with Scarlett while I bring home the bacon. The schedule he needs to maintain is tight. The school is an hour away, plus commute traffic. He leaves home at 7:30am (after getting Scarlett fed and dressed), and drives to Berkeley. They play at school until noon, then head home for a brief nap. Scarlett's therapies are provided by a separate program, so after her nap (or often in the middle of it) they head off to PT or OT in the afternoons Monday-Wednesday. That leaves Thursday for all the doctors and specialists. Friday, he goes to work in the afternoon while my mom takes Scarlett until I get home from work. As you may imagine, this first week has been difficult. We are all tired, including Scarlett, who is finally sleeping through the night after a few months of 2am screaming parties. The laundry is piled up, phone calls are un-returned and we've eaten out a lot. But we are making it work, and hope that things will level out over the next few weeks. As difficult as it will be for me to miss out on so much of Scarlett's day-to-day activities, this job marks the beginning of a new era. We have been scraping by on Chris' minimal Starbucks pay for over a year. We are hoping we can make the most of living with my parents and save so that we can come out of this experience with a more stable financial situation. And in the end, I enjoy my job, despite the crying kids and piles of paperwork. I am glad to be able to get back to the job I worked so hard for before Scarlett was born. We are going to make some time this weekend to work out details of Scarlett's Birthday Blood Drive (coming October 20! ), so we hope to have that available soon. As always, I will try my best to update the blog as often as possible to give everyone their dose of Scarlett! That is great for you! So happy! Congrats on your job! Thanks for the update. That's wonderful! Preschool will be a wonderful thing for your little girl. I think the interaction alone with all the kids will result in good things. It's an exciting, new world for her, and it will give her a new opportunity to grow. Congratulations Brandi!!! That is great news about your new job- I hope you have the best school year! 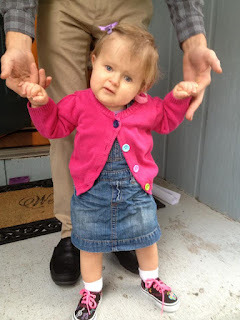 Scarlett is so stinking adorable in her first day of preschool picture... great update! Big smiles here in Indiana for you three!! *happy dance* So thankful you got the job and that Chris is now the organizer. It's so cool that you guys can not only split the responsibilities but also switch them when needed. :)Many good thoughts to all 3 of you as you settle into this new routine. Congratulations!! Great news! Glad Scarlett is enjoying preschool too! Each and every one of you in your family is amazing. Never loose sight of that. Good luck to all of you in your new endeavors! I am SO HAPPY to see this picture of Scarlett standing up in her cute little school outfit!!! I will continue to keep your family in prayer, Brandi.. It continually amazes me to hear about your journey.